For durability, ease of maintenance, and sleek sophistication, nothing beats the many virtues of glass. 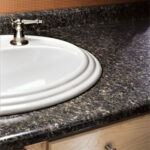 A longtime favorite for desk and table tops, glass is now gaining in popularity as a countertop surface. And, with its simple elegance, it can complement almost any type of home decor. Glass left clear will go with any color scheme, or, one side can be painted to match or contrast with a room’s predominant color. Etching or sandblasting, curving or beveling the edges, will also lend visual interest to the application. Glass is generally manufactured in rectangular sheets anywhere from 1/4 to 1 inch in thickness. Artisanal glass is hand- and custom-made to specification. During installation, glass can be easily cut to accommodate any configuration. 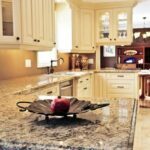 Though glass can chip or even break with a large enough impact, its virtues are that it is impervious to heat and stains, making it a good choice for both kitchens and baths. However, it can scratch, and it is difficult to keep free of fingermarks, which even clean hands can leave. 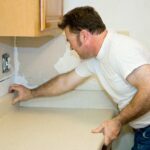 In addition, though cleaning up messes is easy, any residual water left on the surface can leave permanent water marks.